Your special day deserves an unforgettable venue that you and your guests will remember for a lifetime. Whether you are planning a wedding, family reunion or corporate retreat, the picturesque White Mountains surrounding The Ranch at Southfork provide a stunning backdrop of natural beauty perfect for any occasion. The Ranch at Southfork offers the most unique experience in the White Mountains. 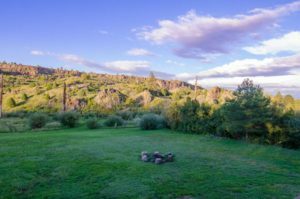 A stunning destination for your special event nestled in the pine trees, just four hours northeast of Phoenix. Guests will be instantly transported to another world as they enter the expansive grove of pine trees, large grassy spaces, and enchanting rustic elegance. Whether your special event is grand or very intimate, The Ranch at Southfork is the ideal location for your mountain destination wedding. The Ranch features 6 well appointed cabins to accommodate all your event guests! Let our team help bring your vision to life by creating the special event of your dreams here at The Ranch at Southfork. Contact Us today!